Circles, the new recording by Venezuelan pianist Benito González, his second as a leader, speaks of an artist taking stockas he moves forward. This album for me marks a cycle that ends and another that begins," says González. All my experiences are portrayed in this album." And what a remarkable journey it's been. Circles reflects everything I had been living in this cycle in my life." If the recording has a classic, 1960s sound, it wasn't premeditated, but a reflection of what I was hearing. Also, I'm a fan of that period. It was a very rich time in jazz and I think it's being overlooked," he says. And the musicians [on the record] all immediately knew what to do. There was great chemistry in the studio." The album features old friends Christian McBride and Ron Blake alongside Azar Lawrence on tenor sax, Myron Walden, on alto and soprano sax and Jeff Tain" Watts, drums. 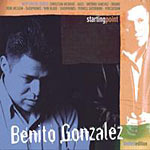 Each of the nine tracks has a definite meaning and purpose, says González, be it a tribute to Elvin Jones ("Elvin's Sight"), Kenny Kirkland ("Faces"), a piece dedicated to his daughter who will be seven in November ("Elise"), a meditation on the continuous moving, resettling, and making and losing friends in his life ("Let's talk about you and me") or Blues on The Corner," a nod to McCoy Tyner, one of his most obvious influences. People always pick up on McCoy's influence in my playing, but I actually started out with Herbie, and Chick and Bud Powell. 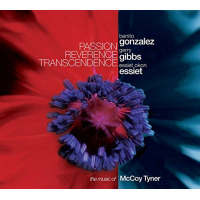 It just turns out I've been involved in music situations that call for that sound, especially Kenny Garrett and Azar Lawrence, who I first heard on my favorite McCoy [Tyner] album Enlightenment. People talk about McCoy Africanizing the piano, making it a percussion instrument, and I feel very comfortable playing in that style. It feels very natural." González was born in 1975 in Maracaibo, the second-largest city in Venezuela, to a family of amateur musicians. Everybody played an instrument, but until I showed up nobody had committed to the madness of becoming a professional," he says with a laugh. He started by playing percussion with uncles and cousins in a traditional Venezuelan band. At 10, his godfather taught him the rudiments of music and how to play the organ to accompany the choir at services in the local church. Four years later, the congregation bought a piano and Benito moved on to that instrument. I never took lessons," he says. I'm self-taught." The traditional Venezuelan music we played is called gaita," he explains. And, as you can imagine, originally it didn't have any technology. But by the time I learned it, that music featured piano and keyboards and some very contemporary chords. What I didn't know then is that I was learning jazz harmonies. So when I heard Chick Corea on the radioI believe with 'Return to Forever'I remember asking my mom 'What's that?.' And I told her I wanted to play that music because I loved what the pianist was doing. My mom turned to me and said 'Are you crazy? That's jazz. You have to be very good to play that music.' But as I started to hear more of Chick and Herbie Hancock, I realized that they played some of the chords I played, it's just that I didn't know what they were called, and that piqued my curiosity." At 16 González moved to Caracas, Venezuela's capital, by himself, to pursue his dream. A friend found me a place to stay. I didn't have anybody there, but my dad traveled there often for work so that helped," he says. And I started by borrowing jazz harmony and piano books and going out and checking out pianists." He started to work in pop bands and as an accompanist of singers, most notably Frank Quintero and Maria Rivas. A big break came when he was called to fill in at Juan Sebastian Bar, a historic club and the hub of the jazz scene in Caracas. A one-night stand became a regular Monday through Saturday gig as a leader of the house trio. That's where I truly developed my playing, and that's where I heard all the great players who came to town. It was a great experience," González says. While at the club he met producer Nicolas Robertson who was in town working on an album with Okyerema Asante, a Ghanaian master percussionist who played with Hugh Masekela and Paul Simon among others. The encounter led to González recording in Asante's album and being invited to move to Washington, D.C. He did in 2000 and shortly after met saxophonist Rene McLean and joined his group. I´ve been very lucky to work with people like Rene McLean. He gave me a lot of advice not only as a musician but personally," says González. He stayed with Rene for two years, before auditioning for Rene's father, saxophonist Jackie McLean, who was looking for a pianist. I went to Hartford [CT] to The Artist Collective where Jackie had his thing, and I remember his reaction when he auditioned me and heard me play. He just said 'Welcome to the gang.'" He would remain with McLean until 2004. But along with his work as a sideman, González kept growing fast as a leader and composer. In 2005, he released Starting Point, his first album as a leader, featuring Rene McLean, Ron Blake, Christian McBride, Antonio Sánchez and Pernell Saturnino. All but one of the tracks are originals by González. Also that year, and without his knowledge, González was entered in the Great American Jazz Piano Competition, at the Jacksonville Jazz Festival. My then-wife had tried to get me interested the year before, but I was too busy, and she tried again in 2005, but I had the new record out, so I thought it was too much," he recalls. But she send an application with a copy of the album anyway, and a few weeks later they wrote back saying I was one of the finalistsso now I had to go." He played and won. There were some brilliant pianists competing. I'm so proud of that win," he says. In 2006, saxophonist and bandleader Kenny Garrett called. They had met in 2003, while González was in New York for a week long engagement with McLean. Nothing seemed to come off it then but, three years later he was putting together a new group and was looking for a pianist. We got together and played, but also talked about concepts for long periods of time at his house. I knew it was the right situation for me and we have been working together since. Kenny has been a big mentor for me" says González. González is also proud of having worked with artists such as Azar Lawrence, Curtis Fuller, Pharaoh Sanders, Bobby Hutcherson, Ignacio Berroa, Roy Hargrove, Steve Turre, Hamiet Bluiett, and Nicholas Payton. I´ve talked a lot with Rene and Kenny about the jazz tradition," he says.  Unfortunately there not that many old masters to pass on the tradition to young players, so what you get is musicians who can play it all technically, but the music just doesn´t sound right. I've been very lucky. Jackie taught me a lot, for example. He would sit at the piano and tell me 'Try to play this, this way.' And I thought I was doing it right, but when I heard Jackie playing it, I understood how it had to be done. And he knew the history of jazz but was open minded. He would tell me to listen to Bud Powellbut also Mulgrew Miller and Kenny Kirkland. And all that has nurtured me." As for the next cycle, he remains open but focused on the work at hand. In my first record I had a clear Venezuelan influence, and perhaps someday I will go back to it," he says. But this record reflects where I am today. Circles is the summation of my work to date." This story appears courtesy of CHC Network.